The Waterman Short International Cartridge Fountain Pen Ink flows freely and evenly. The standard international size makes the cartridge available for use with Waterman and other fountain pen brands. The short size fits most barrels. Choose from several different colors of Waterman ink. The Waterman Short International Cartridge(6pk) Fountain Pen Ink usually ships within 1 business day unless otherwise specified. 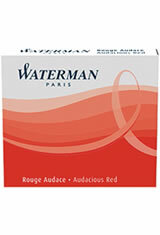 Each Waterman Short International Cartridge(6pk) Fountain Pen Ink we sell is guaranteed to be genuine, authentic and will arrive brand new & unused! what size cartage do you have ..I need 1 1/2"
The Waterman short cartridges are 1 1/2" and the long are about 2 3/4" so you would want the Waterman short cartridge.